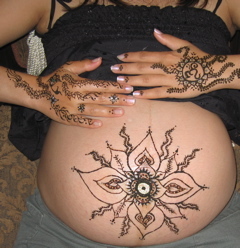 We here at LAPregnancy try to keep as current as possible with the hip and groovy things to do while you're pregnant and after and what could be more "hip" and "groovy" but a henna on your Belly?? 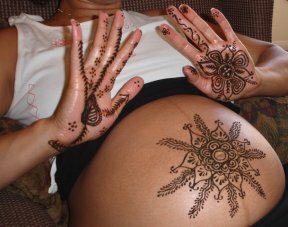 We've been told that henna during pregnancy is an ancient practice and is soothing as well as calming! It is believed to help bring about an easy birth and healthy child. 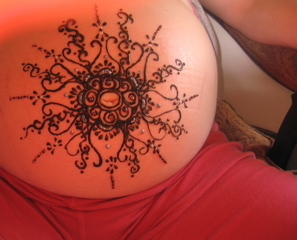 Many countries including Morocco and India have traditions of applying henna during the third trimester of pregnancy. And henna is believed to protect and bless the mother and child from any evil or malicious spirits that may be near during delivery. Henna lasts about 2 weeks and is 100% natural and safe. Doesn't this sound good to you???? It sure does to us!! Call LAHenna today for parties, private sessions, baby showers, parties! They're really wonderful and creative and amazing! !